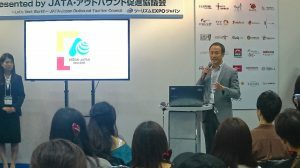 Tourism EXPO Japan is the biggest travel fair in Japan, participated in by 136 countries and regions from around the world including prefectures of Japan, as well as 1,441 companies and organizations from tourism industry. 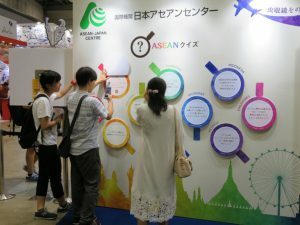 AJC promoted ASEAN Member States as travel destinations by distributing information materials and setting up “ASEAN Quiz”board from which the visitors would access various information on ASEAN countries. 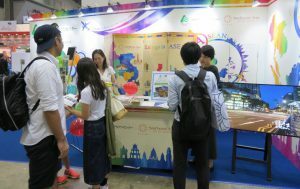 During the EXPO, tourism promotion seminars for students were organized by Japan Student Tourism Association. AJC made a presentation about its activities and mentioned that AJC will continue to put efforts on promoting outbound tourism to the ASEAN Member States towards the youth market in Japan.